Price per person on Hostelworld? Currently Hostelworld doesn’t support price per person on any of their rates. Still, here is some information you might find useful regarding your Hostelworld room types. On Hostelworld you can set up to sell beds (in dorms) as well as private rooms. This is the most common way to sell “rooms” on Hostelworld. For room types in Sirvoy sold as dorm beds and used in the connection to Hostelworld, they will naturally have to have the setting: “Number of guests: 1”, “Max. number of guests (incl. extra beds): 1” and have the object type “bed”, like in the example below. Still, some choose to sell private rooms too. As an example let’s imagine you have the below room type connected to Hostelworld. The highest price 90, will automatically be divided by the highest amount of guests allowed 2 (set in “Max. number of guests (incl. extra beds:”). We will send the price per bed, in this case 45. However, the room will not be bookable on Hostelworld for only one person. The room will only be bookable at the price for 2 persons. The same is true if the maximum amount of guests is set to 4; guests will have to book the room at the price set for 4 persons. 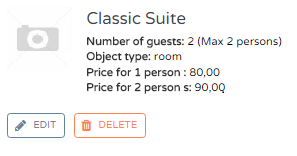 When booking the room type on Hostelworld, this information will show: “In order to secure a Private Room, you will need to book the entire room.” So simply put; the rooms will not be possible to sell at a lower price than the one set for the maximum amount of guests. How will the Integration between Sirvoy and my Sales Channels work?